You are here: Home | Chair Massage | Game On!! Summer is nearly here, and you know what that means. That’s right. Golf. Here on the West Coast we have had unprecedented weather for the spring season, it is nearly summer in May! That means you are going to be out on the greens longer and working harder. Because Golf is hard. Whether you’re an avid athlete or a just a weekend warrior business executive who’s looking for a little stress relief and time away from the every day, the low impact sport of golf can still put a toll on your body if you don’t prepare properly before your game and take the time for proper recovery after you play. Incorporating massage into your summer golfing routine can help you play like the pros, while enjoying many games of 18 holes pain free. The crew at Pamper Your Soul knows how to release those specific back, neck, and shoulder muscles associated with the game of golf. That’s why we’re the team to call when you’re planning on your next golf tournament event anywhere in the Metro Vancouver area. The golf swing is a stressful, forceful and repetitive motion that can erode the muscles in the rotator cuff. This will result in muscle soreness and reduced joint movement. Being in the best shape you can be in and being kind to your body by warming up properly, having good form and drinking lots of water (not beer) while you are playing will help benefit everything about your game, and keep you healthy. 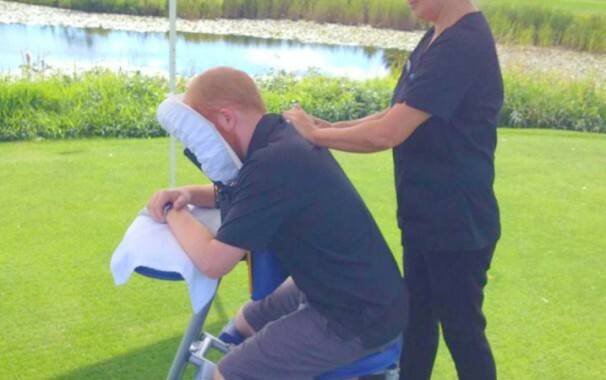 A massage station can be used as a pre-game warm-up at the putting green, a revitalizing refresher midway through the course, or at the club house after the game. Pamper Your Soul Mobile Spa Inc will target the areas where muscles are stiff and sore, and will ensure your tournament is the one your guests will remember!